Civilized Animal can be booked through this site. Civilized Animal entertainment booking site. Civilized Animal is available for public concerts and events. Civilized Animal can be booked for private events and Civilized Animal can be booked for corporate events and meetings through this Civilized Animal booking page. Unlike most middle agents that would mark up the performance or appearance fee for Civilized Animal, we act as YOUR agent in securing Civilized Animal at the best possible price. We go over the rider for Civilized Animal and work directly with Civilized Animal or the responsible agent for Civilized Animal to secure the talent for your event. We become YOUR agent, representing YOU, the buyer. In fact, in most cases we can negotiate for the acquisition of Civilized Animal for international dates and newer promoters providing you meet professional requirements. Civilized Animals unique blend of original music has gained them national recognition. 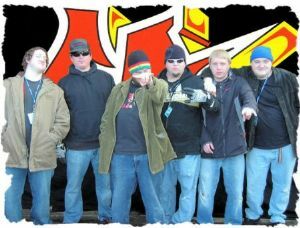 From Ska, Reggae, Hip Hop, Funk, Punk Rock , Civilized Animal has created a new groove for audiences of all ages. With their high energy live performances, Civilized Animal has landed slots with N-Sync, Weird Al Yankovic, Smashmouth, The Calling, CCR, Grand Funk Railroad, Fishbone, Starship, Jimmies Chicken Shack, Dennis Quaid, Chris Cagle, The Flys, 311, Green Day, The Mighty Mighty Bosstones, Long Beach Dub All Stars, MXPX, Papa Roach, Finch, NOFX , Something Corporate, New Found Glory and many , many more. Civilized Animals great quality for entertaining has got them gigs at The Gorge Amphitheatre , Fargodome, Silver Mt. Resort, Schweitzer Ski Resort, Spokane Interstate Fair, The Byte Of Salem, Central Washington State Fair, Pig out in The Park, Carroll College, Gonzaga University, Embry Riddle College, Eastern Washington University, Pierce College, Spokane Arena, The Met Theatre, Spokane Community College, Wenatchee Valley College, Garlic Festival, Seattle Hempfest, Spokane Falls Community College, Montana State University, Snoqaulmie Pass Resort, Live After Five, First Night, Greyhound Park Event Center, Majestic Valley Arena, and many more. With 6 consecutive years on The Vans Warped Tour in numerous markets across the country,3 albums(20,000 units sold) and several compilations under their belt, Civilized Animal is available for your special party or concert. Book Civilized Animal for your next event! Would you like to have Civilized Animal perform at your next corporate event, party or concert? Simply fill out the simple interest form below, and we’ll start the booking process.